Columbia, Mo. (Sept. 6, 2018) — Tucked among the names of graduate students and professors listed in a recent issue of the academic research journal “Media Practice and Education” is undergraduate journalism student Caroline Dade. The Rogersville, Missouri, native contributed to one of the research reports as a freshman at the Missouri School of Journalism. 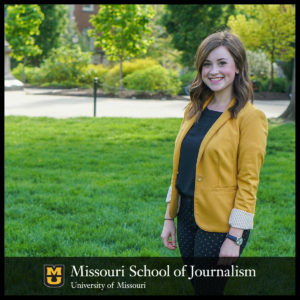 Dade, now a junior, completed “Local Broadcast Journalism, User-Generated Content and Boundary Work,” as a research project for her Discovery Fellowship at Mizzou. Discovery Fellows are high-performing freshmen and sophomores, all of whom have earned a 33 or higher on their ACT, selected to conduct research in their interest area and given a $2,000 scholarship. She was named an Outstanding First-Year Discovery Fellow by the MU Honors College in spring 2017. Missouri junior Caroline Dade, who admits she likes dense academic reports, says she has enjoyed being able to “bridge a gap” between the journalism industry and academia with her research. Mizzou has always been a part of Dade’s life. Father Jay, BJ ’85, JD ’93, studied magazine journalism at the School before switching his career focus to law. Jay, a shareholder in the law firm of Polsinelli, has served in leadership roles for the Mizzou Alumni Association and the MU Jefferson Club. Caroline’s brother Christopher just graduated with his bachelor of science degree in chemistry. The radio-journalism student co-published the paper with her Discovery Fellow mentor Brett Johnson, an assistant professor of journalism studies. The paper explores the topic of how broadcast newsrooms across the country are developing and implementing ethics codes on the subject of publishing user-generated content. Dade is preparing to publish another academic paper with Johnson and journalism doctoral student Liz Bent. She contributed to the research as a sophomore Discovery Fellow by inputting data and synthesizing information into lit reviews, she says. Dade also was asked to help present the research at the 2018 Association for Education in Journalism and Mass Communication (AEJMC) conference in Washington, D.C., rubbing shoulders with graduate scholars and professors from colleges and universities around the world. This research focused on the discourse of journalism surrounding using leakers as sources and how that’s evolved over the years, she says. Johnson asked Dade to talk about methods and how the researchers went about conducting the study during the AEJMC presentation. He said she went above and beyond what he asked her to do and talked about the “why” behind the study methods, too. Dade, who admits she likes dense academic reports, says she enjoyed being able to “bridge a gap” with her research in areas where there seems to be differences between what’s being taught by college classrooms and what’s being practiced by the news industry. She says she knows these papers are contributing to the knowledge she’ll need once she works full time as a journalist.